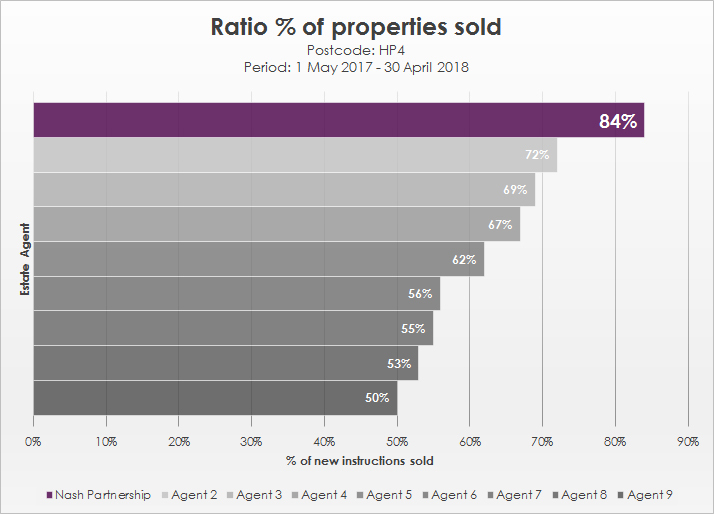 In the year 1st May 2017 to 30th April 2018, Nash Partnership sold 83.5% of the properties we had available in the HP4 postcode during that time. Out of the agents currently operating in Berkhamsted, that figure puts us almost 40% ahead of the performance among the other 8 agents sampled, whose average was just 60% of listed properties sold. I’m pleased to say we also agreed more sales in HP4 than any other estate agent in Berkhamsted during the same period. However, while selling more property than anyone else might be a nice claim for an estate agent, it doesn’t necessarily provide an accurate picture of how likely that agent is to sell any given property. If we listed 120 properties for sale but only sold 60 - even if that number was the highest number of sales in town - it would only provide a homeowner with a 50% chance of moving; not a great prospect! However, by selling over 8 out of every 10 homes we list, we show our clients in the clearest of terms that they can be confident of a successful move with us. We do not claim to be perfect, but why does using using Nash Partnership in Berkhamsted give you such an increased likelihood of a successful sale? 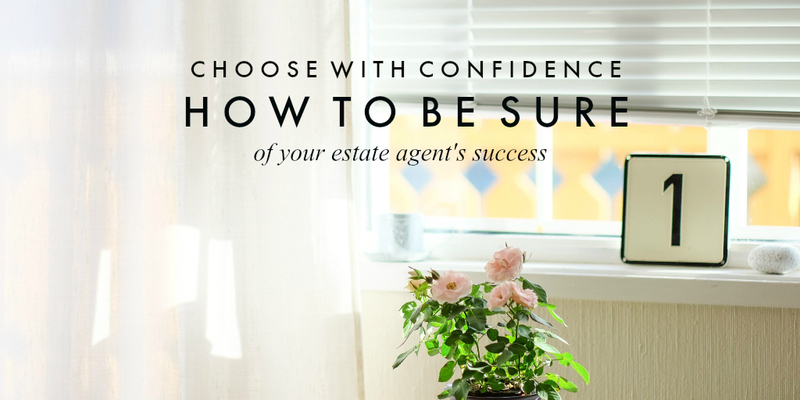 I’ve written below what I see as the most valuable things an estate agent can do for its homeowner clients to deliver the highest chance of success. 1) Incredible photography. I’ve long believed that the single most important thing in the marketing of a property is the photography. You can have all the experience, personality, charm and negotiating skills on the planet, but without generating the correct enquiries, those qualities are rendered worthless. If the best view is from the air, we’ll use a drone for aerial shots. If the detail is exquisite, we’ll employ an architectural photographer. And if the weather isn’t right, we’ll take the photos again. And it goes without saying that we would never, ever use a photo from a smartphone on our brochures or website! 2) Exceptional marketing. Without providing a premium service that is tangibly more sophisticated, there would be no reason to use Nash Partnership over anyone else. By producing only the finest quality property brochures; by having beautifully fitted and centrally located offices; by having well-trained, experienced people representing the properties we wish to sell or let, we demonstrate that we mean what we say. These are essential investments if we want people to say: “Yes, this is what I want for my home”. And perhaps the best vindication of our philosophy is our International Property Award for Estate Agency Marketing. 3) The art of listening. For me, the most important skill for any estate agent to have. It seems strange to even be writing about it, but as it’s the largest complaint about our industry, it’s something clearly often lost. While our obligations are to the seller of a property – the person who pays our fee – it is remarkable what a difference it makes to buyers when they are properly listened to. Really taking the time to ask the right questions and to get to the root of the answers delivers an incredibly useful insight into what people say they want, any why they want or need it. This regularly produces creative solutions – and indeed more sales – through approaches like “hmm, this might just work for Mr and Mrs so-and-so because they said…” Listening to people makes them feel valued and makes them want to talk to us more. And listening to people makes them want to buy through us (we know this because they tell us). 4) Having high standards. While it might be understandable for someone to be a bit disorganised or five minutes late, these things are of no value to either us, our clients or any customer; so we strive to have them form no part of our day. This can be challenging – and we are, like anyone, not perfect – but it’s well worth the work. Simply being aware that arriving on time or returning someone’s call makes a huge difference to their experience, changes the entire team’s attitude to what we might call “the little things”. It’s a matter of not being led by what is understandable, but by the service we wish to be known for. For me, these are the actions and values that make a tremendous difference in both the chances of selling a property, and to the experience of our clients and customers where so much hinges on a successful outcome. If you would like to discuss any aspect of moving home, you’ll find the team at Nash Partnership more than willing to assist.